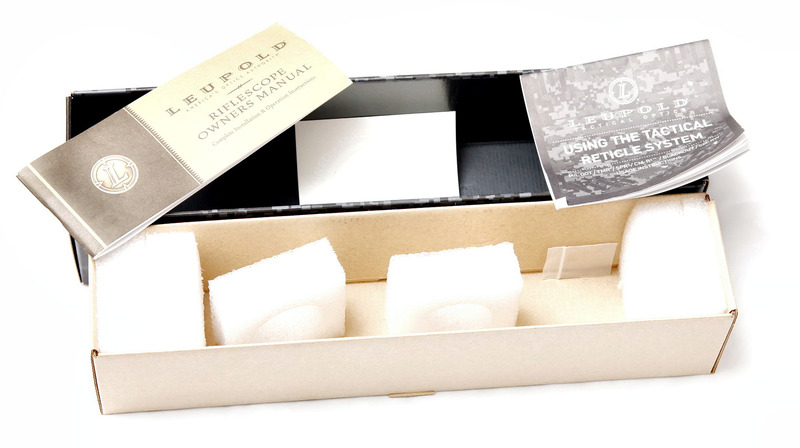 According to Amazon the Leupold VX-R Patrol 1.25-4x20 (Model number 113769, Firedot) has the dimensions of 9.4 x 3.2 x 2.9 inches. 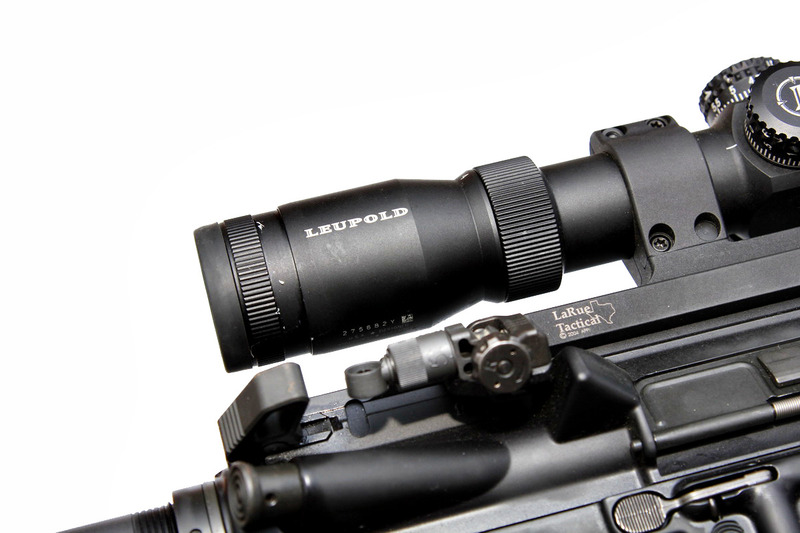 It has a matte finish, a special purpose reticle and motion sensor technology, per the Leupold product website. It has a 30mm tube and comes in at around 11.50oz. I purchased the VX-R from a local gun shop for a little under $520, but it can be had for around $480 from many online retailers. 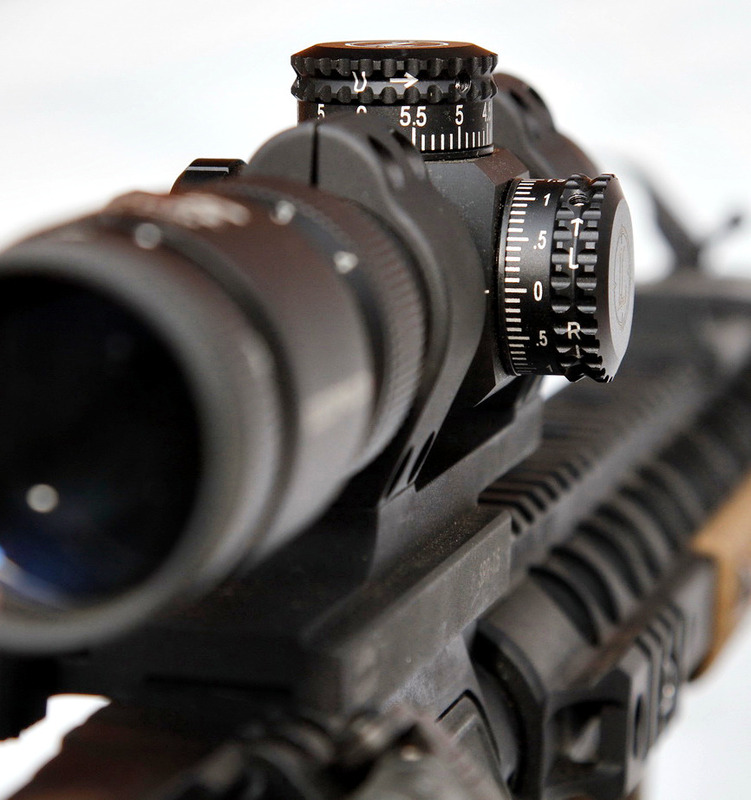 The VX-R has the Firedot special purpose reticle. 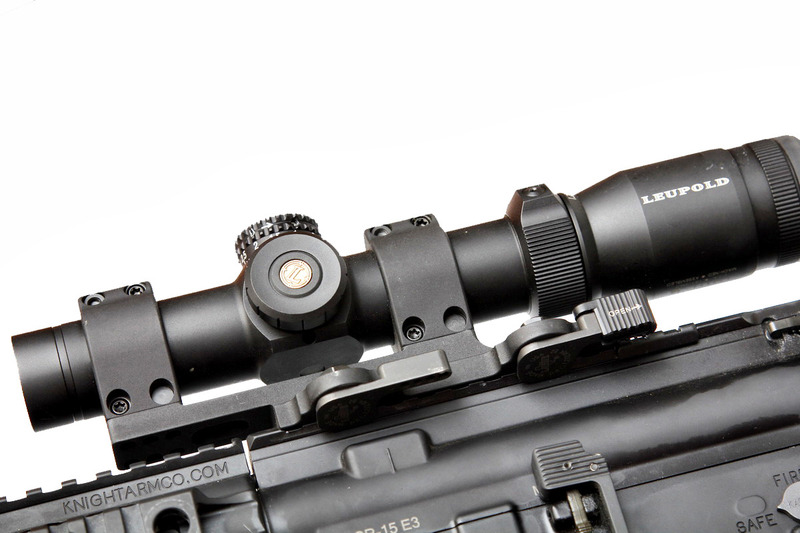 According to the LaRue website the LT104 / SPR mount puts optics at 1.5 inches above the rail for optimal cheek weld. I purchased the LT104 from the LaRue website for $210. The VX-R was my first step into owning a variable optic. I did a good amount of research before making this choice. I had somewhat of a flexible budget ranging anywhere between $500 and $2500. Having finger banged a few different optics, I was going to default to the Swarovski Z6i, having seen a few different shooters have that optic on their rifles, primarily at the F2S High Stress class, as well as the VX6 Multigun which has the same reticle as the VX-R. After doing some thinking and considering application specific circumstances, I went with the VX-R. A high-end optic will not increase my ability to utilize my rifle. While it will not hinder it, I wanted to get the bare minimum requirement while still having some features that I prefer. In my AO, I will very rarely, if ever, be required to make a 100m shot, 4x would really help for discrimination, so with these concepts and the understanding that I can always sell the optic and move onto another if it was not to my satisfaction, I went with the VX-R. I originally had ordered two piece rings for the VX-R. After arriving, they were the wrong size, and I had a weekend of shooting coming up and I wanted the VX-R mounted on my rifle ASAP. A friend of mine had an LT104 / SPR sitting around that he was saving for a USOptics variable optic, and he let me buy it from him (I ordered a replacement for his later that day). 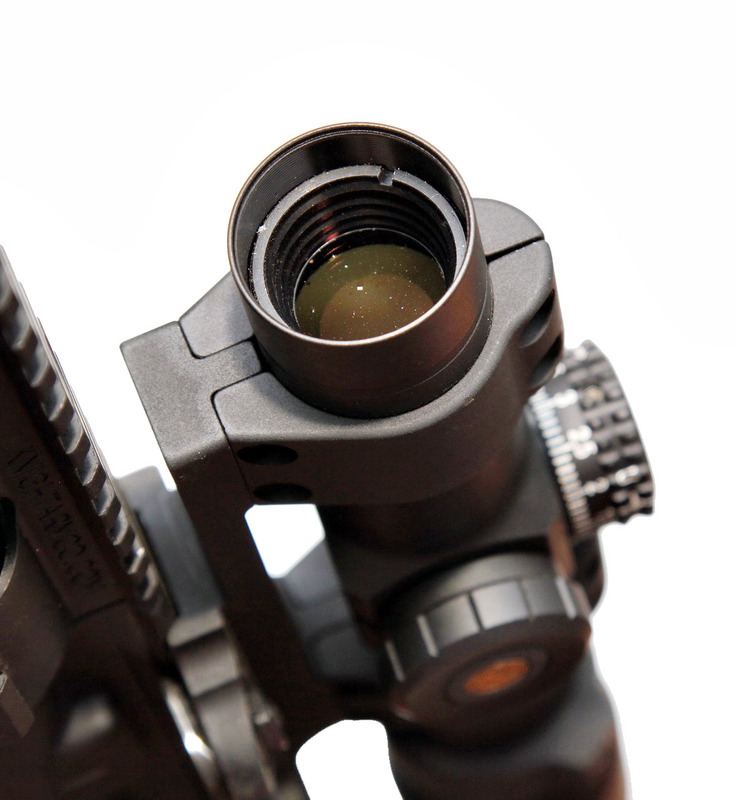 LaRue has been my go-to for optic mounts, I have had only positive experience with their LT751 which holds my Aimpoint H1 in place, a review can be found at the link. Install was pretty straight forward. I did not do any sort of torque spec, I just hand tightened it and used the provided loctite. I found the optimum position for it on the top of my receiver, which is basically the only place I could have put it due to the offset KAC sights. The optic came rested in some protective styrofoam sleeves along with a general manual that ship with every Leupold optic, a tactical reticle hand book (which gives pretty good info), a Leupold sticker (for my non-truck) and the smallest hex wrench you have ever seen, I mean its damn tiny. I took the optic, mounted it and went to zero on some steel at around 25y, initially. Zeroing the optic is pretty straight forward, though the manual makes it seem like its more complicated then it is. You basically find where the hits are going, twist the top and side turrets (without loosening them up) until you get the optic where you want it (for me it was a 100m zero - F2S website). Once you get the optic to hit where you want it, use the tiny hex wrench to free the turrets, each one has 3 set screws which are tightened really well from the factory. It felt like the wrench was going to snap at any moment initially trying to loosen them. Once you get them loosened simply twist them to 0 and tighten the turrets. Now if you do adjustments it will click, with the screws loosened the turrets will just spin freely. Again, not rocket science, I just wish they made it seem a lot easier in the manual then they actually did. I went through this process three times during a recent class with Bennie Cooley (AAR link here), once I got the zero I wanted I set it and forgot, it did not move for the three days of shooting we did (I confirmed zero every morning). The fact that the button with the gold Leupold logo turns the optic on, and then adjusts the five brightness settings is big plus in my opinion. The optic remembers the last setting, which for me was always the highest brightness setting. The fact that the turrets spin freely and that you can knock off your zero with a bump is kind of annoying, especially if you are doing active work with your rifle on. Of course its as easy to fix as looking at the optic, seeing it is not on zero for both turrets and clicking it over, literally takes two seconds, but could be a deal breaker for some people. (At worst it will throw your zero 3-5 clicks in any direction, with at 100m is not that bad of a shot) The glass on the VX-R is very clear. I positioned it so that at the lowest setting (1.25x) it was clearest, since that is the setting I will most likely have it at during any work. After setting the VX-R to the correct location, I set the parallax. You might notice it is pretty dirty, that is because I had duck tape on it to keep the parallax setting in place because it does move on you (Protip from Bennie Cooley), I took the tape off for pictures. To set the parallax you can follow the manual, pretty straight forward. The LT104 / SPR mount came in the standard LaRue box/bag combo with a wrench, some loctite and all the screws/bits that are required for installation. The whole install took all over 5 minutes, and that is with me double checking my work going slowly. 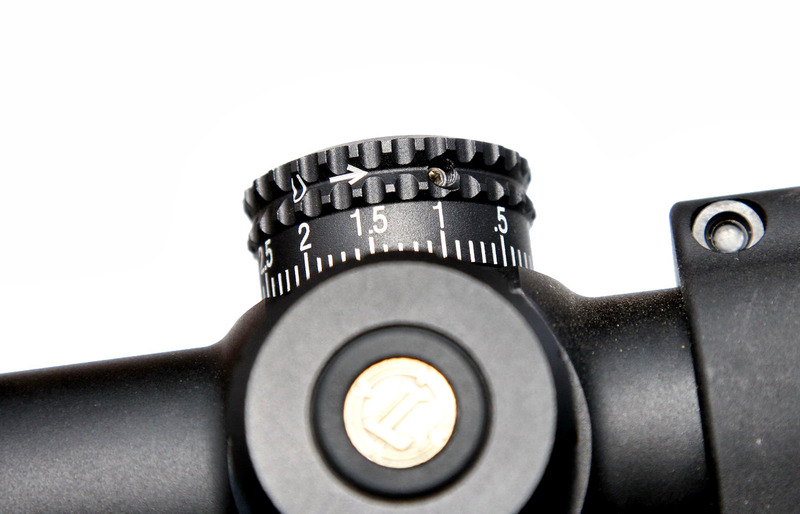 The QD release levers were set to proper tightness (trick is to make sure you set them and forget, because if you change the setting you may need to rezero the optic). The LT104 has the quality I have come to enjoy from LaRue and performed the way I expected it to after I confirmed my zero. Of course I do not trust any mount, so I would always reconfirm zero every chance I get, because it does, sometimes. Since buying and installing the VX-R and LT104 I put somewhere between 1700-2100 rounds through my rifle. At least 1500 (approx.) of those rounds were at a 3 day rifle class. I have used magnified optics before, I had a Trijicon TA31F-G before I bought the Aimpoint H1 and have been running it every since. So I am most familiar with an RDS in terms of target acquisition, holdover and application. 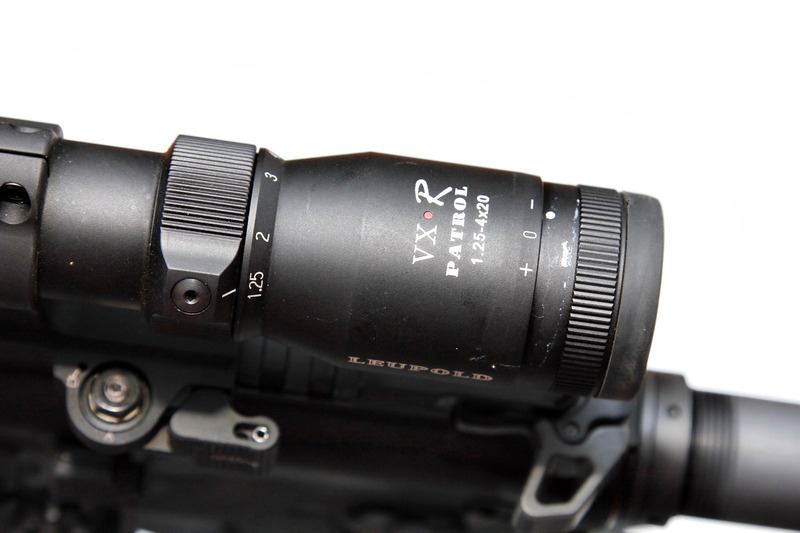 The 1.25x, lowest magnification setting, the VX-R has is not close to the true 1x of an RDS. The variable optics I have shot or eye-fucked before were not close either, even if they advertised they were, the closest was the Z6i, but for how much it costs, I would not accept anything less. Still, at 1.25x engaging targets 50y, even 100y in was not difficult. The Firedot that Leupold put into this VX-R is very bright and near-RDS level. At 30y and in you are basically running an RDS and target acquisition is only limited by the user, not the optic. When you get out to 100y, that is when you need to really focus and concentrate, but then you can mess with the magnification and find your personal sweet spot. I had no issues running the VX-R in the 1.25x magnification the entire class, I used it as if it was an RDS and when we did shoot prone, precision or zero shots I turned it up to 4x. I did not have any issues with the turrets turning on me and my zero walking. We did transition, moving and kneeling drills where I had a sling and kit on, it never moved on me. One aspect that I figured I would have an issue with is multiple targets, primarily from side to side, each target being outside of my view in the optic. I found that sometimes I would need to shut my left eye in order to focus my eyes on the reticle and/or the Firedot to keep it from going blurry - only at further distances, since upclose I focus on the target and put the Firedot on it - this may be an issue for some. The optic ran exactly the way I wanted it to and expected it to throughout the class. Forgetting to turn off the optic is not a big deal as it does not really deplete the battery too badly. The fact that you can just hold the single button for 5 seconds and it turns off is a pretty good feature. I would like to find some sort of cap for the front and rear, since the glass gets dirty with transport. There is a motion sensor on it, but I do not use it, nor want to use it. I guess its fine that it is there, but if you keep track of turning off your optic not much of an issue. 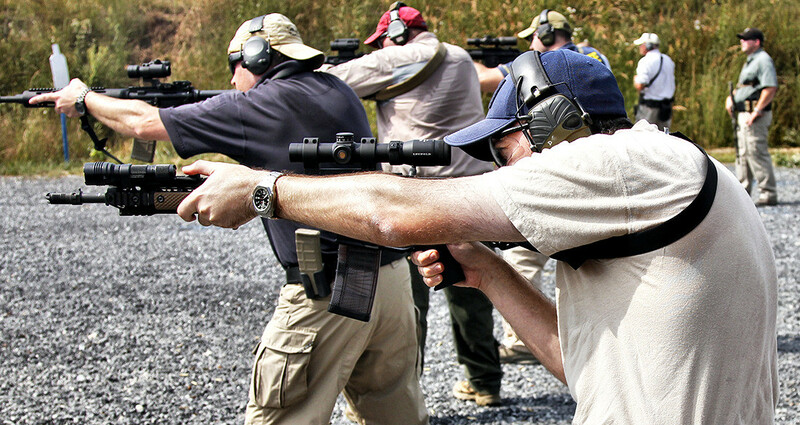 It is not an Eotech that you need to fingers to turn on/off, its one single press of the button. The LT104 does its job without issue and more than likely will continue to do its job as long as I do my part and not mess with it. This is a no brainer optic. You buy it, slap it in an LT104 and run it to your hearts desire. It will do what you need it to do as long as 1.25-4x20 are the specifications you need. My particular situation may be different than yours. If I lived in a rural area with lots of hills and less buildings, I might have gone with the Leupold VX6 1-6x Multigun, and I might still. The truth is, I purchased this optic and mount because I wanted to get some experience under my belt without putting a giant hole in my bank account. Could I use a Z6i? Of course, who would not, but is it applicable to my specific situation, how about yours? 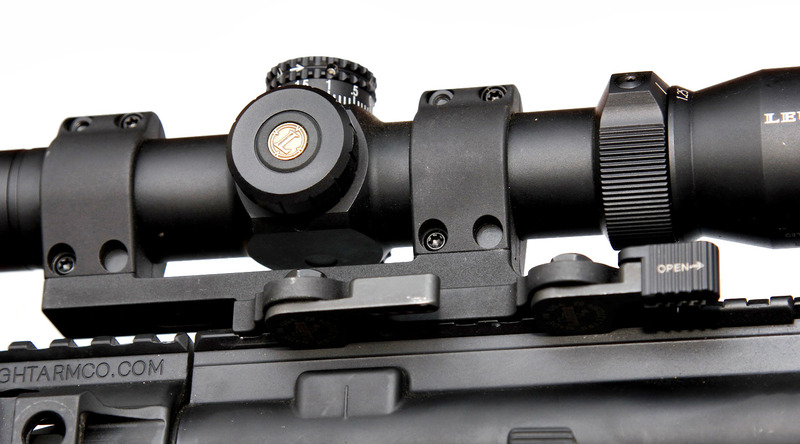 For a 5.56 rifle, especially an AR15, this optic/mount combo will fit many different applications. Contrarily, if you are looking for a replacement for an RDS this is not it. If you want a variable optic that works like an RDS in one setting and a spotting scope in another, this is definitely not the optic for you. In fact you will probably be hard pressed to find an optic that does that under at least twice the price of this optic. My opinion is that since it is labeled as a "Patrol" optic it has just enough features, and hit the price point, that many LEO's can purchase, run on a working rifle and not have much of an issue doing anything that a LEO with a working rifle will need to do. For the average gamer, this might not be enough, and for those high-speed super tacticool operators and/or gamers than need .5MOA precision, look elsewhere. For the rest of us that can do just fine with the best of the lower end variable optics, this is plenty.